On colder days its worth covering the neck, and upper chest. I've found the best way to do this, is with a light scarf or a "multi-tube". 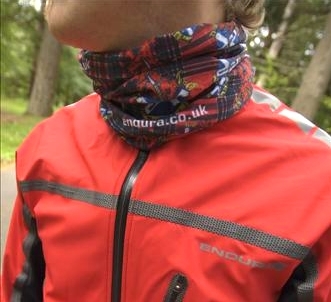 I prefer the Endura multi-tube to the scarf, mostly because of it's versatility. Not only can it be used in a scarf-ish manner, but it can be pulled up over the nose and face, with minimal sun glass fogging, unlike many wind proof balaclavas. Though the fabric is light, it is often enough to take the edge of a wintery day and make riding more enjoyable. Come visit us at the shop and try one!